Welcome my friends, to the 2012 Where Bloggers Create blog party!! I know we are all going to have a wonderful time visiting all the blogs and soaking up more inspiration again this year! I decided to post a little early since so many of you have already started trying to get a sneak peek!! LOL!!!! My space has changed a little since last year but the basic layout is the same since it is a small room and I don't have many choices for layout. The major change is that I finally painted all the black furniture white and creme! This change was caused by visiting all those gorgeous white studio's over the past several years and looking longingly upon them!!!! I finally decided I needed to do what made me happy so white it became!!! If you would like to see what the room looked like before, you can click here. I've also filled the room with a lot more vintage goodies since last year. I got this idea from somewhere on line, although I'm not sure where. So whoever you are... You inspired me! Thank you!!! As you can see my vintage scale collection is all over the house. I also have one of my favorite pieces of all time here in my studio. My architectural salvage angel. Isn't she a beauty?? I have the paper snowflakes I make at Christmas time hanging in the window, only here in my studio they are called "stars". LOL. The glass front cabinet was really a piece of junk we found at a garage sale for $5.00. I gave it a little TLC and now it holds all my jewelry making baubles, soldering equipment and mosaic glass pieces. The multi-drawered pieces came from JoAnne. You just put them together and finish them however you wish. Ever since my friend Charlene gave me the idea of using cut glass to hold glitter, I've been collecting salt and pepper shakers whenever I find them. Now I have a nice collection and they hold all sorts of sparkling powders and glitters. Last year this was full of books and magazines, but really wasn't being utilized well. Those went in the closet and I filled it with all my favorite fabrics so they are right at my fingertips when I need them. This cubby unit was also filled with papers and ephemera, but I've been using all the lace and trims a lot more, so I moved out the paper and brought in the ribbons, lace and doilies. I bought this doll along with 3 others on Ebay, planning on altering them. Well.... I haven't got around to that (and so many other fun projects that I want to do) but she was my favorite and I think I'll leave her alone. She looks happy where she is with a crown upon her head. Does any one else love the sound of buttons going into in glass jars??? This is my collection of altered bottles. I went crazy and made several in a row, and then was done, and ready to move on to something else. Come on girls... I know you do that too!!!!! The fabric door panel is where I moved all my paper ephemera and doo-dads. I like being abl to see what I have rather than keeping it boxed up. I usually have an out of site out of mind mentality, so it helps in the creative process if I can see what I have to work with around me. I have an affinity for empty frames, so I decided to use some of them to create this piece last year. It hold my favorite piece of advice for all time... "follow your bliss"
The chair is an office chair from Ikea. I just took two king sized matlesse' pillow cases and slipped one over the chair back and tucked the other onto the seat. I stays in place like it was made for the chair. I picked up this printers drawer at one of the Sweet Salvage sales and it holds bits and pieces of things I'm working on or (to be honest) whatever I don't feel like putting away at the time. :) The books are my two altered books I've made so far. The one in the back is my own creations and the one in the front was from Lisa McIlvains class at Paper Cowgirls this year. I have plans of making a few more before I (again) move on to something else. And finally, my office where I actually spend the most time creating. No, it's not pretty jewelry or altered books, or fabulous mixed media art, but it is something I love to do. I get to create beautiful blog designs for all of you and I am grateful for that everyday!!!! I hope you enjoyed the tour of my studio!! I can't wait to get started visiting all of you. If you haven't already done so, please turn off your word verification (if you use it) for a few weeks during the party to make it easier for everyone to leave a comment on your post. After all, we all like comments don't we??? (Just go to "Settings" > "Comments" and then "NO' for word verification. Thank you all for Visiting!! Have a fabulous time!!! Oh I've been waiting for you to post your studio space! I love all of your fabrics and ribbons and jars of buttons...and that was a genius way to slip cover your chair....I never would have thought of that. Thanks for adding my blog to your list. I am going to take all the time it takes to visit everyone...fun! Hi, so glad to see your work environment. It's so "feminine" compared to my muddy and dusty surroundings where clay turns into pottery. I enjoyed it, and will soon be looking at all the other's studios. This is a fabulous idea! Congrats, and thanks for all the work to pull it together. How pretty Karen! Love all your lovely laces and whites...so sweet!! Thanks so much for hosting this great event. We truly appreciate you and your hard work. Oh Karen this space just keeps getting more lovely every year!! Your seating area is so very pretty- love the gorgeous shade on the floor lamp! Thanks so much for having this fun party-I have been looking forward to it for months as I finally have a space to show off! Still a work in progress but it's a start! Thank your hosting this great event again to give us all a chance to share our creative spaces with other creative bloggers and inspire eachother! very nice! just a dream! Your space is amazing, I like it very much, everything is so romantic, I've been working preparing my craft room too, buying all kind of old furniture to restore, hopefully mine will look like yours in a few months. I'm fairly certain your creative space is as close to Heaven as they come: breathtaking! I'm a bit confused, where is the link to the party? Wonderful room Karen! So beautiful and peaceful; I simply adore all the vintage goodies.... I know what you mean by a refuge from the hubby's "choice" of entertainment... I do the same! Thank you so much for hosting this wonderful party... I have been looking forward to it for months! Oh Karen! 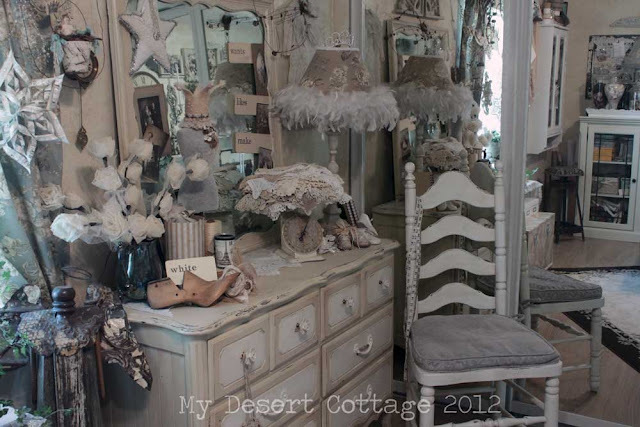 What a beautiful creative space and haven of lace and all things vintage and lovely! Thank you for sharing and for hosting this marvelous party!! I love your space and love the white and cream. It is more soothing, although your studio was so pretty last year. I am still working on my studio, maybe next year I can join in. I am looking foward to being inspired by the creative spaces by all the talented folks out there. This is a great idea! Hope you stop by and meet Love. Her dressing room tour is now open. Thank you for hosting and you know I'll be back several times. Beautiful, Karen! I'm glad you went with what you love with those furniture color. I love that lampshade in the first picture. I have a stray lamp with a shade that needs to be done that I plopped in my room. I need electric on that side, so I'm not in any hurry. Love how you use those old salt and pepper shakers. They are so pretty yet functional. I'm sure I'll get lots of ideas again this year from everyone else's creative spaces. Thanks so much for hosting! I love everything about your beautiful creative space and office. You have added so many pretty details and I love the white transformation. I'm going to just enjoy all the party goers this year. Our home is for sale so I have kinda dismantled my craft/sewing area. I shall live vicariously through yours and everyone elses. it all looks so fantastic...still making last minute changes to mine before I pick up the camera...thanks again for hosting this fun event! Oh goodness - your studio is so charming. I love your new white and think that it showcases your vintage collections better than the black. Your scale collection is great and your studio space is stunning. Thank you so much for hosting the blog party. P.S. I love my new banner and I am so happy that it was ready in time to attend the party! Love your blog!!! I'm having so much fun visiting everyones blogs! YOur studio is like a dream come true, enjoy! Just beautiful , Karen! Full of so much inspiration! I have been looking forward to this event now for quite awhile!! Thanks so very much for hosting this party and for all the work you do so we can sit back and enjoy seeing everyone's creative space! I love your space...I could live there....lol!!! I love the way you have an office area and creative area. (You make beautiful blogs by the way). The office chair pillow case cover is an awesome idea I have not thought about. Might just have to try that myself. Thank you again for the inspiration, friendship, and beauty you bring us everyday!!! Such an amazing creative space!! love all the details and imaginative ways to hold and display your supplies. Thanks for the tour! Oh my - your studio and office are awesome and absolutely gorgeous..... My space is not even up to par to yours - but I do love it anyway. I will try to get my party blog up tonight. Thanks for all of your inspiration and for including me! Karen it's all just so Fabulous! I totally agree with your decision to paint your furniture white. I love all the frill and fluff that you have surrounding you. How wonderful you must feel when you are in your room away from the "lame" TV shows...LOL. Even more wonderful you have another space for your office! Thanks so much for hosting this event. I look forward to participating with my little studio and to viewing all of the other places where women create. What an absolutly beautiful work space. I love your office even in the photo it gives off an air of peacefulness, I guess that is why your blog designs are always so nice. Thank you for all the work you have done to make this event possible....I can see cans of white paint in my future, due to your inspiration! Absolute heavenly! White and cream are so calming. Your room is adorable and must be a joy to work in. I saw last years and what a beautiful white difference. Thanks for hosting again, Karen. Your space is adorable Karen! All in white is perfect though last year it was fantastic too. I love all your vintage things. Just lovely!! I really enjoyed my visit. Thank you! Your studio is a dream! Love all the creams and white. Hoping one day mine will be that too. Your work is beautiful! What a beautiful place to create in. You have inspired me to work on my space and hopefully will join you next year. Karen, Just a great studio. So serene, and having all your treasures around to inspire you is heavenly. Thanks for hosting the party. Best wishes! Your "Creative space" is wonderful! Thanks for sharing it with us. You have my Dream studio!!! SO many pretty and inspiring treasures. I would just keep enjoying your space and not get any crafting done! love love love this!!! Your space is just so beautiful!!!! :D I have no words girl! fantastic! Oh my! Your space is crafter's heaven!! Can I move in? You have so many beautiful supplies and the room is artfully arranged. Thanks so much for hosting the party! Looking forward to seeing everyone's creative spaces! Beautiful and totally you! (and I don't even know you :)) Thank you for hosting this fun hop - I am looking forward to seeing everyone's spaces! Karen, your studio is just stunning! I have onlyvisited 6 or 8 blogs so far and my head is already spinning with ideas and inspiration. Thank you so much for hosting this event!! I am totally in awe of your beautiful space for creating -- it is absolutely gorgeous. It is YOU -- it is truly everything that I thought it might be. Your vintage treasures are exquisite -- I'd love to pilfer in your collections all day long. I love the way you have your collections displayed -- it's easy to tell that this is the place that speaks to your soul. Thank you so much for once again hosting this incredible event -- THE most amazing event for bloggers everywhere! I know you spend hours and hours putting this all together for us-- thank you my friend! Your photos -- as always -- as truly gorgeous! Oh my goodness I love your space, it's sooo inspiring and beautiful!! :) Still hoping around to others' blogs! :) Thanks for hosting this awesome amazing parttttty! :) Have a happy weekend! Karen, your office is beautiful! It's so feminine and full of lovely treasures! I love you collection of buttons,lace and fabric! I would never leave here! Thank you for hosting another amazing party! I discovered this a year ago when I started blogging. It was and still is such an inspiration! Love all the changes you made in your workspace Karen. So many neat ribbons, lace and sparkling things to create with. Very lovely space my dear!!! I always enjoy creating in it with you. Big hug!! I must get myself some jars for my buttons. I am also going to go searching for pillow cases for my chair. Thank you for hosting and for sharing your fabulous ideas. Your studio looks amazing! Thank you so much for this awesome party! Such a great idea. Loved your studio last year, even if the dogs chased me going in. But this year I REALLY love it with all the white. My errant strand of fur won't show up as easily! Which means that purrhaps you'll let me visit more! Yes, yes a good choice indeed! And piles of fabric and lace, another very good choice. "She" also had changed her book/magazine location for the same reason as you, and couldn't be happier. I'm okay with it really - gives me a variety of napping materials, as some days I'm in the mood for a full page spread to lay my whiskered head on and other days, I purrfer the soft alure of old hemp or linen fabrics. Well it's all very lovely indeed, but then I wouldn't have expected anything less from you of great creative powers :) Thanks for hosting yet another wonderful year of Where Bloggers Create! We appreciate you! HI Karen, I"m not sure how to join this party but I would just to be a part of it! Also I have to say I love the changes you have made in your space from last year. It is lovely with the whites and creams. I'm getting ready to pain my daughter's bathroom and she is leaving to get married. I told her it is time for a change! When I saw your room and the colors, and how beautiful it is I decided this is the color scheme I want to go with. Just lovely! Here I thought I was early and find I'm actually running behind. I love the changes you have made and your desk. What a clever idea to cover your desk chair with pillow cases. Now THAT was inspiring. oh my goodness this is unbelievable!!! I love how you painted the furniture this year, oh I want to spend time in your room...love all the changes. What a beautiful and very creative workspace! I especially love the vintage touches and the sweet old pieces of needlework like the doilies that remind me so much of my sweet grandmother. Thank you for a lovely visit and a fun blog party. Let the swooning begin! I read your words and I felt like they were coming out of me. I want to paint everything now...if only time allowed. You have inspired me to do so. Merci beaucoup! I don't know where to begin, as you space is so wonderful, I keep scrolling up and then down again. Simply beautiful, Karen. The layered frames and shabby cubbies are my favorites. Big sigh..love them. Love your space - so inspiring and such pretty little things!! Thanks for having me in your hop. Fun! Your studio is wonderful. I love the new colors. The cabinet of fabric is beautiful and I love the hooks filled with hanging lace. Oh, I just love it all! It's so sweet of you to host this again...I participated last year and truly enjoyed it. I wasn't able to this year because my craft room is re-locating to another area in my house...but I sure will enjoy visiting everyone's special places...so much inspiration!! Love how everything is white.....it is such a nice look. Thanks for hosting such a great party......always my favorite thing to check out is everyone's studio. I love, love, love seeing everyone's creative spaces -- thanks so much for hosting this and for sharing all the photos of your creative space. It's gorgeous! Hello! Oh, how I love your workspaces, they are phenominal! Thank you for sharing them. I am so very very new to the blog world. just purchased your book. Havent had time to sit down with it, yet. I dont have a clue as how to attend a blog party or anything. Just know I want to do this so very badly! I'm so happy to see this early!!!! I really enjoyed touring your space, Karen. It's full of beauty and inspiration and looks like a place where anyone can be comfortable. Thank you so much, again, for hosting this party! Hi Karen, I just love your studio redesign and all the details. I adore organization using vintage finds and your space is perfect. So very inspiring with great ideas. I too redesigned my space and is totally different then years past. Going in a white direction here too and all through my home. Loved your studio and thank you for sharing your time and talents with us all once again hosting this special event. Have a great weekend and fun at the parties around blogland. This is truly delightful, seeing your fabulous studio photos! I love your beautiful storage ideas and the white furniture, you must feel so inspired and peaceful there. Thanks for hosting this party again! Wauw, what a wonderful studio, i love all the vintage items and your beautifull creations! Wat a nice weekend, i love your blog party! Thank you very much for hosting dear Karen. What a beautiful space Karen!!! Everything is absolutely gorgeous ...what a wonderful place to create in ~ pure inspiration! Your studio looks great! I'm like you in that this is the 4th year of the party. A lot has taken place in these 4 years. Glad to be here again this year. Hi Karen, I loved your studio with the black furniture but I love it even more with the painted pieces. 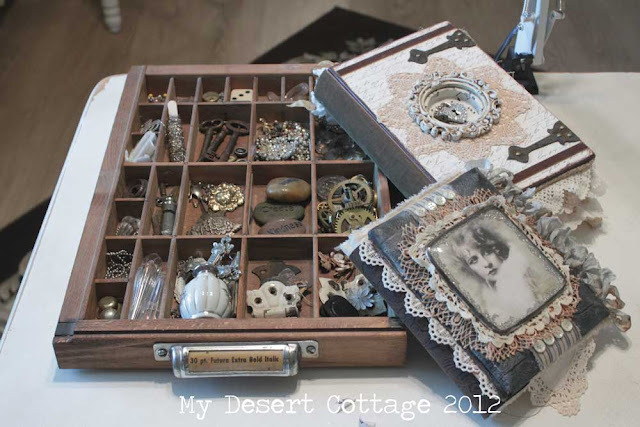 You've collected lots of beautiful vintage treasures and your supplies to use in your fantastic creations make me drool. Yes, I too love the sound of buttons going into a glass bowl or jar :-). Your place is very cozy and inviting. Thank you very much for sharing and for hosting this wonderful blog party! Everything is GORGEOUS! Thank you for hosting us and instilling inspiration and creativity. I have been waiting for seeing your creative space and I am not disappointed. All looks so perfect, clean, beautiful and all your goodies awaiting your creative hands. I do not know if i will have the time to visit all the creative spaces participating in your party but at least I will try to visit everyone who will let a comment on my blog. I wish you a creative summer. Blessings and Bonjour de France ! Wow, your creative space is fabulous. I finally had something to show off this year. Missed getting on the list, but I'll know how to do it for next time. I'm so happy that Vicki told me about your party and persuaded me to join in. I have to go back now and immerse myself in your beautuful studio! Hi Karen, I'm speechless. What is this simply breathtaking. Your creations are beautiful!. Thank you so much that we could look around in your hobby world. Your studio is beautiful, Karen! It has such a cozy atmosphere. I could spend hours in there looking at all your goodies! Hi Karen - I agree the cream and white is so much better. I too love the all white studio decors. I am already thinking about changing things around in mine! It is so inspiring to see all the studios. It feels like such a peaceful creative space, Thanks for sharing with us all and for hosting the WBC. What a beautiful space you've created, Karen! I'm going to borrow your idea of using pillowcases as a cover for an office chair, if you don't mind. I can't sew, so pillowcases should be just the perfect thing. Thank you so much for hosting this party...now I'm off to visit other creative bloggers! I love the wonderful whites! I could stay and play in all your goodies for days. Thank you so much for hosting this great event. Love your creative spaces, very peaceful and romantic. I look forward to visiting all who have joined in this year. It is always inspiring to see other creative spaces. GORGEOUS!! What a dream studio! Wow! Wonderful space to create! Love all of it! Like the white furnitures! You really have been busy in transforming you beautiful studio - everything flows. Love your many vintage vignettes especially your glass shaker vignette and your cubbie which houses your collection of laces. It is so wonderful to be able to surround yourself with all these beautiful elements to inspire you and us too! Thank you so much for hosting this blog event and we really do appreciate the many hours that have gone into making it happen behind bloggers' eyes! I love the transformation Karen! Your vintage scale collection is also wonderful. I love the saved doilies on top. I especially love the Ikea chair redo! So simple , and I would have never thought of it. (I have black Ikea office chair too and it sticks out like a sore thumb.) What a wonderful space, I would want to be there all the time too! Such a magical creative space you have Karen! Surrounded by all your inspirational supplies, and displayed so nicely, surely keeps your mind whirling with ideas! Thank you for hosting this fabulous get-together again. I love visiting everyone. i love the new look of your studo, so beautiful and serene! thank you for hosting, i can't wait to visit all the inspirational spaces. Oh Karen, what a beautiful space you have. Your photos are lovely and it all looks so warm and inviting. I really enjoyed browsing around. Thanks for hosting this tour - it's my first time participating and I know it will take me several weeks or months to visit everyone, but I will. artistic! The studio spaces are pure inspiration. I found myself "visually" crafting as I toured your lovely creative space. Thank you for this special treat that I look forward to each year! How did I miss this beautiful blog before? So glad to touring so many beautiful creative spaces.Yours is lovely.Someday I hope to have my own.Hard to believe it but I really don't have anything set up special to call my own.I have a space.But I would not dare share it LOL.I am now following along now too!Have a wonderful weekend. I love your space! It is so beautiful and serene. I really like your vintage scales. I've been wanting to start collecting some too! You have a lovely creative craft room. I can't decide whether I want to move into yours or Karla's (Karlas Cottage). Wowie Zowie! such an amazing space. I REALLY, REALLY like the white! Good for you. Thank you for sharing this beauty with us! What a lovely place you have and so many great things and a lot of links to other blogs. Have a nice evening. created.. where was my brain? and am having Creative Space Envy.. have to get me ready for next year! Love your post and your beautiful space. I've been waiting a YEAR to see what you've done to your room. All I can say is...WOW! 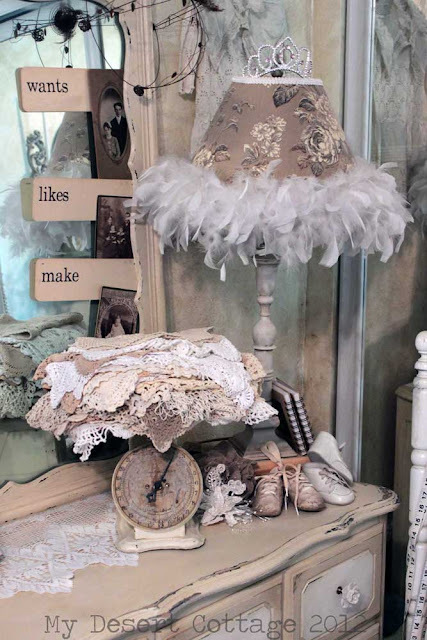 Love the cubby of laces and the frame--"follow your bliss"--I'm going to have to borrow this idea. Seeing your room has really inspired me. Oh, and I'm going to cover my ugly black desk chair with King sized pillow cases. Thanks for the inspiration, Karen! The things you do....such style. It is magical in the whites. I am in serious awe. Your studio is beyond beautiful, like a breath of fresh air and home all rolled into one. Thanks so much for hosting this huge party of like minded people. Off to peruse the goodness. I thought I left a comment when I first read your post. I may have but I did want to tell you that I think your studio is fabulous. I am trying to paint all of my furniture white but have not done so, maybe by next year. Thank you for your hard work and I am so looking forward to visiting all of the studios listed. Karen thank you for bringing all of this together. Your studio is very pretty a I love being able to get a glimpse into everyone else's too! Love your studio. Next year I will join you and post my studio. This is so much fun!!! A good way to meet new people and make friends. Happy Happy blog-party day sweet Karen!! What a fun concept to share with other artful women! I can't wait to check out out everyones spaces! I hope the cast iron pitcher arrived today!!! A very beautiful white dream! nice decoration...I love them al..
What a lovely post - it's so good to see where you actually CREATE! What a great place to work. I'm sorry I wasn't able to participate today. Since contracting Bell's Palsy, my energy level has been practically non-existent...and when I do have some energy, so many other things call, rather than working on organizing and staging my office/creative space for a post. Perhaps next year, I can participate! Stunning! Your space is breathtaking Karen. Thanks so much for hosting this wonderful event! Karen you space is beautiful. You are so creative. Thank you so much for sharing your space and hosting this wonderful blog party. So much beauty to behold Karen! Thank you for hosting again this year Karen. Your space is simply beautiful. Beautiful beautiful beautiful space, my friend! I am so happy for the opportunity to glimpse into the creative world of so many people (including you!) Thanks for faciliting this great party! It's just so dreamy and perfect. Thanks so much for hosting this fun event and for all the inspiration through the months. Well, I'm obviously doing something wrong. I can't get your blog off Reader, so I'm not being allowed to view your wonderful party links or join. I'm so bummed. At least I can view your wonderful space. It's so gorgeous, Karen. I have been waiting for this big day to start. I don't have a space to show during this tour, although I want to do the tour with everyone to see the beauty everyone has created. Beautiful space! 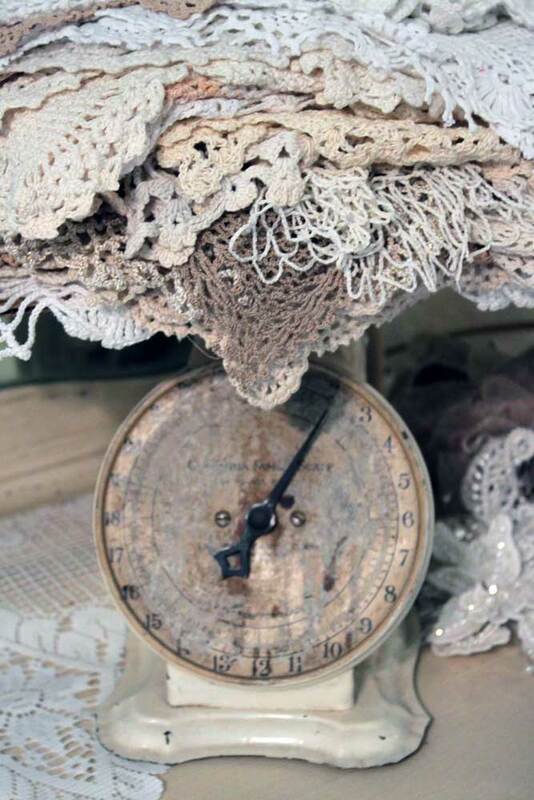 I LOVE the cubby holes filled with laces and love the lace doilies on the old scale. Thank you for sharing your space. I LOVED your studio space. What lovely treasures everywhere you look. Thank you so much for hosting this party and allowing everyone to take a peek into many many studios/craft spaces. Your room is amazing!! I love the whites and creams you used in your decorating choices. I love all the chippy, distressed furniture pieces. I love your collection of altered bottles. Do you have a how to on how to make those anywhere? Thank you for organizing this amazing blog hop! Wow Karen! It is all just heavenly! What a beautiful space to create in! Thanks so much for sharing! Truly inspirational! Unfortunately, my studio isn't done, so I'm not participating. Please just remove my name from the list so people don't get irritated. I notice several people came over from here today. Thanks again! I will definitely be participating next year!! Lovely! I love all the laces and doilies but my fave idea is your glitter shakers! What a beautiful space! I didn't realize how disorganized I am until I saw your wonderful room! Your creative space is beautifully dreamy. Sigh...one day when I have a room of my own, I want a space just like yours with an added small stage for me to work on my acting. Karen your space is beautiful, warm, and inviting. Thank your for hosting a lovely gathering! Thanks for linking me to the blog hop! I am still at awe of your room. You have everything I love and you display it so well. Thank you for sharing your space with us and letting us in on all the fun too. I'll be arriving in a few hours to move in...Wow what a space etc.etc. Overwhelmed, awed and just love seeing such talent! You are my Yoda! Geez, do you actually read all the comments? So far, I'm #124. I'm impressed. What I like so much about your Where Bloggers Create is that I've always wanted to see the creative spaces of other artists. I need ideas for my two workrooms. I see a trip to Sweet Salvage and IKEA in my future. It's 7:30pm on Saturday, 7-14-12, and it's raining outside, very cool, and my little shih tzu doesn't like it. The sounds make her very uncomfortable. Me? I'm loving all the moisture here in Northern Arizona. See you soon at Art Unraveled. This is my first visit to your blog, and what a post to start with. Since I am a shabby chic/romantic/vintage girl myself, your studio sings to my heart!! Thanks so much for sharing, not I can dream about a space like this for me! Hi! your space is amazing. I love all the neutral colors, the laces the buttons the...... just everything. Thank you for having this delightful blog party. I have been enjoying visiting my visits to everyone's space. It seems like I have been visiting all evening and I have barely seen a handful, I get caught up in viewing all the past posts :) everyone is so amazingly talented. I was about to go to bed when I realized that though I had visited your space I had not said hello. Hello! lol but now I really must say good night. Will be back to visit tomorrow and hop on to some more wonderful spaces. 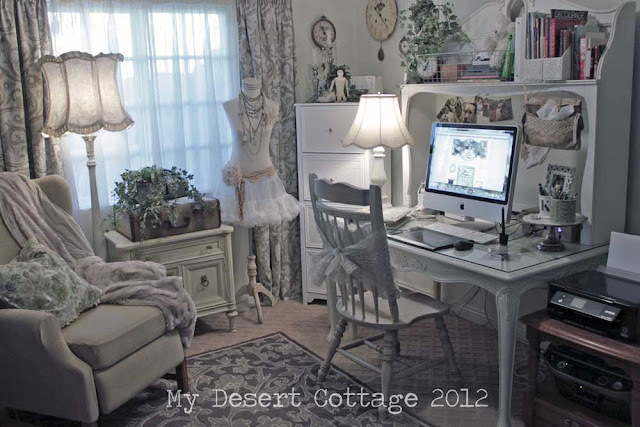 your white studio, and how each nook and cranny is filled with charm and the unexpected. I have looked forward to your party since last August. I visit the creative spaces of your participants over and over throughout the year, "sitting," drooling,and dreaming for a spell in their magical ateliers. Karen, thank you more than you know for throwing "Where Women Create" party each year. It is a major summer celebration on my calendar. And thanks to all of you ladies (and gents) who so graciously share a part of your lives. Karen, what a blessing you are to us - whether we blog or just enjoying reading blogs of others'. Hi Karen, I am so excited! I would love to be added to the party list. Everyone has such beautiful creative spaces. Not sure mine will measure up but I want to show it off anyways. Thank you and your space is just wonderful. Lots of inspiring ideas. Dear Karen, OH what can I say but : stunning! Your studio is a marvelous place of beauty and creativity. I love every tiny piece you have collected ,and every gorgeous piece you have created. Love your old weights wearing lace and plant-love your dolls, and every corner is so cosy, and wonderful, like the one where you have your computer- so beautiful. Thankyou for inviting and showing. I have not had time to "dress" my own studio for this occation this year. Maybe next yearI will happily take part in your wonderful happening. Thanks so much for sharing all the beautiful photos. 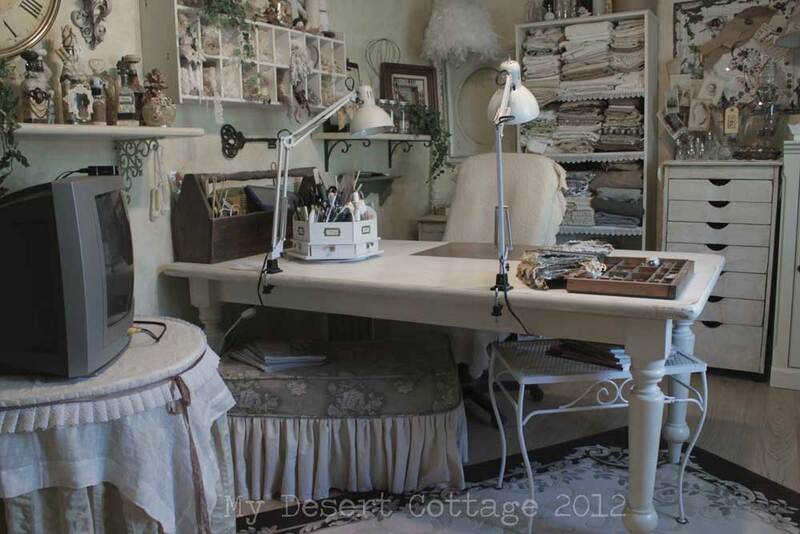 Love your office and the design area is totally a feminine delight. I've convinced myself of the painting thing, but so much humidity here now. Visiting today was like an awesome little tour in dreamland..you've displayed things in great fashion. Thanks for the fun. I love the color changes. You are right. It is soothing. And I am like you. If I can't see it, I forget to use it. Your studio is wonderful. Thank you for this event. Hope your weekend is going well. Well, I found your blog though Plumrose Lane. All I can say is WOW. First of all I thought I was in heaven, your house is beautiful. I am in the process of moving to our home soon and now am collecting items for the look that you have. I also started my own blog about our life just married, and what it turned into was a contact for my family,of day to day things that are happening. I am trying so hard to get a look that your blog has. I also have been an artist one way of another all my life. Most of my kids are grown, but I will take any direction you have to put me on the right track. Karen, Sure enjoyed seeing your studio and office. I love that you made it all white...I know you love the 'mood' it puts you in while you are in there. Very conducive to creativity, don't you agree? I LOVE all the vintage stuff...I guess that's something we all have in common. Makes me want to visit the flea market...NOW! I also love that it's so organized...loved the hooks with your laces pieces hanging from it in such good order. Hello there. Just wanted to say I love your creative space. I am your newest follower! Enjoy your Sunday! Karen! Your office.studio is stunning! 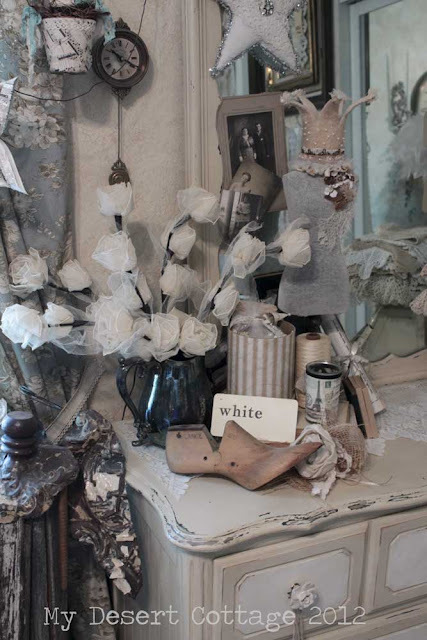 I have been captivated by all the shabby whites, too - but everything I have is in natural wood tones! It seems to do the library and book thing better - which is the foundation of my work. Though, I've a grand white 1930's two level stove and oven on legs that belonged to my grandmother, re-purposed to hold my scraping and art supplies. I think I may give myself another year to really pull my space into gear before I think about participating in the "share your space" party. Loving all the inspiring artists!! First off, a huge THANK you for being such a gracious hostess and organizing this fabulous evet for the fourth year. How inspiring and amazing it is to see that woman all over our globe are soooo creative, and their space so reflect this. Absolutely am in love with your redo....your tone on tone on tone is just so dreamy and inviting. If i ever have a 2nd home, i would be gleaning many of your decorating ideas. It abounds everywhere...and how you have incoporated it all is eye candy for me. Your craft space is FABULOUS!!! i am so pleased to have stumbled upon your blog and the event, i am in the throes of sorting out my own craft room and would love to participate, however i didnt find a linky to add my own space to, pls could you be in touch and let me know how i would go about participating. WOW, I'm speechless! It's absolutely gorgeous! You are a true inspiration. You have so many lovely, creative pieces, and have displayed them so creatively. I really like the distessed white furniture, it just gives the room such a vintage romantic ambiance. Thanks so much for the tour of your space, and thank you for hosting such a wonderful party. We think alike! This past year, I have collected many lonely salt and sugar shakers, and antique bottles. I just drool when I look at your home and your creative space! Love it so much and thanks for hosting this event once again. Thank you for hosting this wonderful party! Your studio is beautiful, as always, and it's fun to watch it change from year to year. I love your frou-frou lampshade! Karen! I just had to come back here and thank you again for hosting this amazing blog party....I had an incredible time....and my daughter was here with me ... we went through each and every link on your side bar....and I'm pretty sure we didn't miss any! There were so many different styles....and it was great to see how other's work in their own personal spaces! Thank you for your encouraging comment on my blog! I love the new cream and white colour scheme. (But the black and white was also elegant) Thanks for organising this wonderful inspiration tour! Oohh...I love your sweet and girly space, Karen! I dream of the simplicity of monochrome but colours and patterns reach out and grab me even when I try to resist...LOL. I was absolutely charmed by your frame project, and your computer space. What a joy it must be to spend time there. Thanks again for being such a gracious hostess each year! Thanks, Karen, for getting back to me. I love the look of the blog. I'm going to participate in Vicki's GROW YOUR BLOG party in January and just sent her an email. I plan to PhotoShop some new photos tomorrow and will post them to my blog. And I will make an announcement on the Typepad blog. I haven't really looked at everything on the blog but I'm hoping you put your button on there already. I don't want to get into that challenge yet. If not, I'll get to it sooner than planned. I will definitely promote you to my Art Unraveled Yahoo Group. 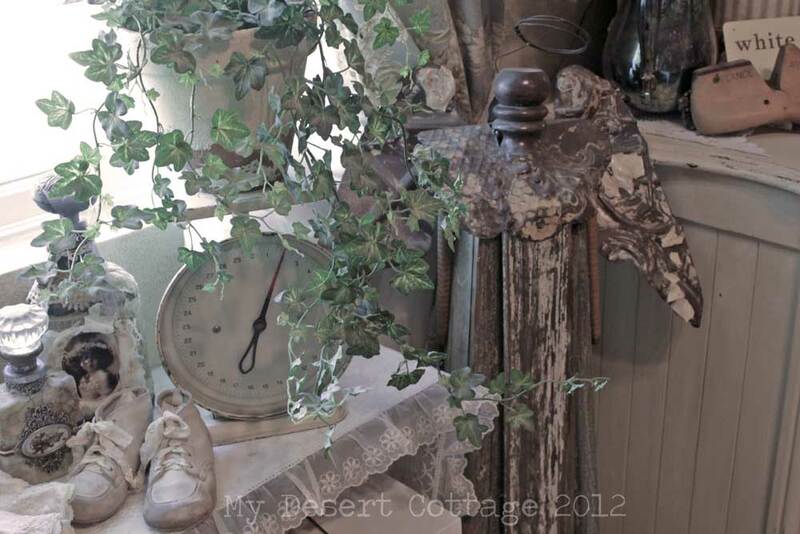 In fact, I sent an email about Sweet Salvage and about you today. It should come out tomorrow and maybe you'll get some new clients. I love looking at your wonderful space! So many gorgeous things to look at! Thank you for hosting this!!! Simply Beautiful Karen! I guess I'll have to do the Altered Bottles next! Thanks for the beautiful tour! How fun this has been. I will definitely be doing this again. Your room is so lovely, warm and welcoming. I also wanted to thank you for the free tips for blogging. I have already incorporated a couple of them, like centering my heading. Thank you for visiting my room and for your kind comments. Your studio is so beautiful and beautiful. I'm sure I will be coming back to visit again and again. Lame show on TV! I burst out laughing. I think a lot of us can relate to that! BTW...thank you Karen for hosting a challenging blog party like this one. This is my first time to join. I've just become your latest follower. I came over from Angie Knick of Time. Your studio is absolutely dreamy. I love every touch, every details, every corner....beautiful! Pretty as a picture Karen. I love the doll with the crown. She has such an unusually pretty face. 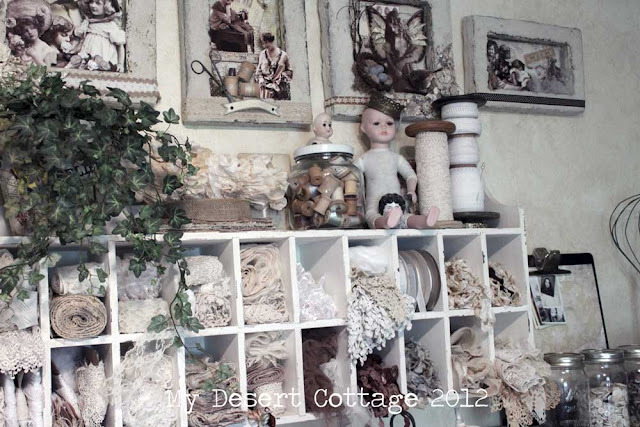 Thanks for sharing your studio and thanks for hosting WBC 2012 oh and thanks for my new blog design. You're the best!! You're doing a fabulous job on the party this year as usual. I do love the new lighter look of your studio furniture. It does really make your space more tranquil and inspiring. I LOVE it! Also, I ADORE the sound of buttons going into glass jars, there's nothing so delightful in all the world. :) Hugs! Hi Karen, Your space is amazing. I could only wish to have a space like that. I was going to share my space, but I'm not finding the link party. Am I missing something? Oh Karen, Your studio is gorgeous. Thank you for hosting this jumble of lovely goodness each year to inspire our souls. I just love it. I did post late this year but I have a good excuse. I was in a minor car accident and completely forgot. Thank you Karen for all the work you have put into this event. I've visited many but still have many to go. As always, you creative studio is truly inspirational. Take care. thanks for hosting again, Karen! i know it's a lot of hard work, but we appreciate it. Your studio is so full of rich texture! it's quite dreamy and I saw a chair I'd like to sit and relax in! i see we collect (like most of us!) alot of the same goodies! wish i could run into you again! thanks for the studio visit on my blog! Your studio is so beautiful... I can look at your photo's all day long.. Thanks for hosting this AWESOME Blog Party..
Karen! Your spaces are FAB.U.LOUS. Love the white re-do in your studio... I love black too, but it really is so soft and restful now. Everything looks amazing. Wow Karen..........i loved your studio last year and i love it even more this year, because of the light furniture. Love everything it and all your beautfull creations. Maybe next year i'm in! Your studio is so beautiful and soothing looking - love it! And all the gorgeous things in it LOL I've seen really cute snowmen made out of the old salt shakers - heads put on and then glitter in the glass part. Karen, your studio is so beautiful! Love the white furniture. You have so many pretty and fun storage ideas. Thanks for hosting another great party....I'm off now to visit all the inspiring studios.